The Siv-inn panel is a customised product offering every solution imaginable in terms of tailored displacement units, and is available as a made-to measure solution as well as with prefabricated plenum boxes suitable for both wall and ceiling mounting. Grilles measuring over 2 m2 are split. Siv-inn PP and PK are available in two standard designs with width/height measurements to the nearest millimetre. Featuring a flush flange, type PP is an ideal slot-in solution. Type PP is delivered as standard with screw holes and screws. Type PK is equipped with a bracket flange and is installed as a protruding unit. Siv-inn PK comes with screw holes fitted with gaskets, and the screws are in a white enamel finish. The front is perforated (15 %) with our clover pattern. 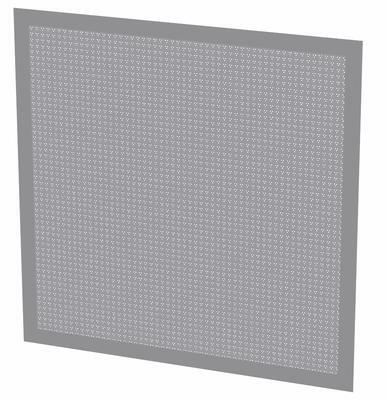 Both types are equipped with a permanent galvanized diffuser plate. The front comes in a RAL 9003 - gloss 30 finish as standard. In order to avoid leaks, it is of utmost importance that the area between grille and spigot is properly sealed. Various installation alternatives are provided in fig. 4.